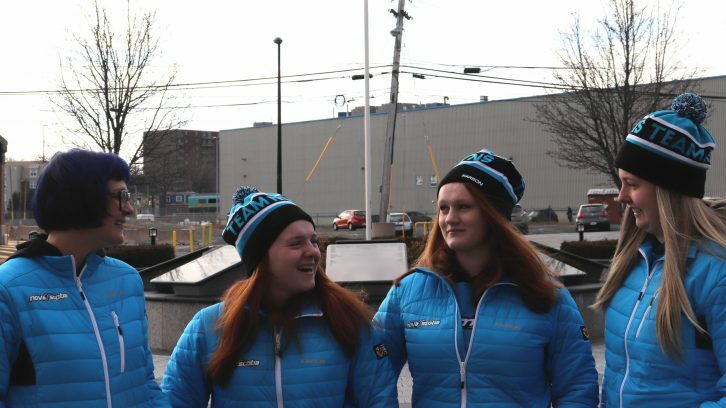 Dartmouth twins Julia and Kayla MacKinnon don’t play many sports together, especially with Kayla’s cerebral palsy. 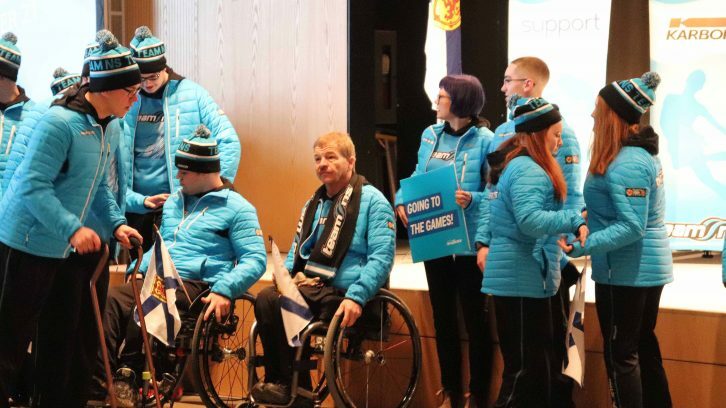 Yet, the 15-year-olds are about to play competitive wheelchair basketball for Team Nova Scotia at the 2019 Canada Games this February. As sisters, Julia thinks they have an edge. “We’re at each other a lot, and we’re more competitive around each other than some of the other players because we know each other so well,” she said after Saturday’s pep rally for the team at the Canadian Museum for Immigration at Pier 21. Wheelchair basketball is unique because it welcomes both able-bodied and physically impaired players. Julia doesn’t have any physical challenges like her sister. Kayla’s cerebral palsy was the result of a mild stroke she had as a baby. Although she can stand on her own, her motor functions on her right side are limited. Just reaching out her right arm is a challenge, and she needs surgery every few years to extend her arm’s muscles as she grows. It has restricted her ability to play sports. “Being on the team is good for me because I’ve never been able to play sports before at all. I’ve always had a lot difficulty,” she said. Kayla started playing for Nova Scotia Wheelchair Basketball three years ago. A year later, the sport caught Julia’s eye and she started playing as well. Assistant coach Cher Smith said their chemistry and support for each other is evident on the court. Sometimes, though, they end up having a little too much fun. “I can’t put them on the same shift. I can’t put them on the same drills. They will just not leave each other alone. They’re really, really annoying,” she said, as both sisters laughed with her. For Smith, who has been involved with the game for over 15 years as a player, national classifier, and coach, it’s the sport’s inclusive nature that makes it stand out. But wheelchair basketball itself isn’t the only thing that’s unique — so is Team Nova Scotia. Teammate Dee Osmond, an able-bodied player, enjoys the camaraderie. A former competitive sailor, she started off as a volunteer before joining the team. They all look forward to showing off what they are capable of doing. More importantly, the players want others to know anybody can join wheelchair basketball. “It’s just such a fast-paced, competitive, strategic game and I hope that people see that at the Games,” said Kayla. “Anyone can play. You can go to Canada Games, even if you do have some restriction,” she said. Since the team is a mix of players with physical capabilities, team members are ranked on a point-based system based on what they can do. For example, one point is allotted to the most physically impaired person, while four to five points are given to the most able-bodied person. Along with player count requirements, both teams need to comply with whatever total cumulative rank limit the game or tournament designates for the court. That means that if your team is allowed a maximum of 15 points on the court, the total sum of all active team members’ points cannot go beyond that.